The furry fandom is unique. Other fandoms revolve around movies, stories, or TV shows; they focus on something was created specifically for an audience. To some degree, our fandom does the same – simply put, most of us talk about Rocket Raccoon on a weekly basis. However, the great majority of the fandom focuses on its members. You are the stars. A few problems pop up because of that uniqueness, though. For other fandoms, executives come together to create marketing strategies, backing communities with a wealth of content. On our end, though, the great majority of creators start on their own; some begin simply with a pencil drawing in a notebook. While the furry fandom itself is a giant community, individuals can sometimes feel like they’ll never make their own mark. For me, I originally joined Furtopia; they were extremely welcoming, but as a writer, I didn’t know how I could get my work noticed. Eventually, I found my place and even put out a few publications, but it took a good amount of work to get there. The best way to get to that point is to work on creating your own community. If you are able to get a group that loves the content you create, you’ll have a much larger drive to finish projects. This may sound intimidating, but odds are, you already have the foundations of a community around you – friends you talk with, creators you follow, and others who follow you. The furry fandom likely brings you together, but your own creativity has a chance to solidify these relationships. Before joining FN, I was active in the speedrunning community. The only problem is that I had an odd niche – bad video games. There were just a handful of speedrunners who focused on bad video games, and most others didn’t care for them. However, we started to come together. We realized the humor that can come from low-quality media, and we focused on entertainment. Because of that, Games Done Quick started having an awful games block. A tournament began focusing on bad games, and a marathon dedicated to these games will be happening later this year. The community is still growing, but it has no signs of stopping. I’ve seen the same thing happen with smaller groups in the furry fandom. One of my friends began with very little drawing experience, but because of persistence and love for transformation, he has helped form this smaller community. Jokes and memes spread across the internet to bring others together. Simply put, if there’s something in the fandom that you love, there are others that love it, as well. Sometimes these smaller communities form naturally, but there are several things you can do to help foster these relationships. Be visible. When you are actively posting online, others will take notice. If you’re a creator, it’s easy to go without posting or talking to others until you have a new finished piece; others online want to see that, yes, but they also want to know more about you. Sharing bits of your life, talking to people, or even posting works in progress can go a long way to bringing people into your community. Share what others share. You likely have furries around you who are creating, sharing, or commenting about things that matter to you. Taking the time to share will show your appreciation, and it will help your followers see what you love. It’s likely that people who engage with your content want to be involved in some way, whether it’s more casual or more formal. Create a hub. In order to last for a long time, communities need to revolve around something; without something central to the group, others will often drift away after time. This hub can be as simple as a weekly meetup, an art stream, a Telegram group, or a Discord server. The community could revolve around an event, a competition, or a critique group. No matter what form it takes, if someone asks how to get involved, have a way they can take the step from being a follower to being a member. Be genuine. Others will see through you if they realize all you’re doing is working to get followers. If complimenting an artist, describe the reasons you like that art. If starting a conversation, reply to others and dig deeper into the topic. Furry Network works to help others find like-minded individuals while eliminating the feeling of isolation. 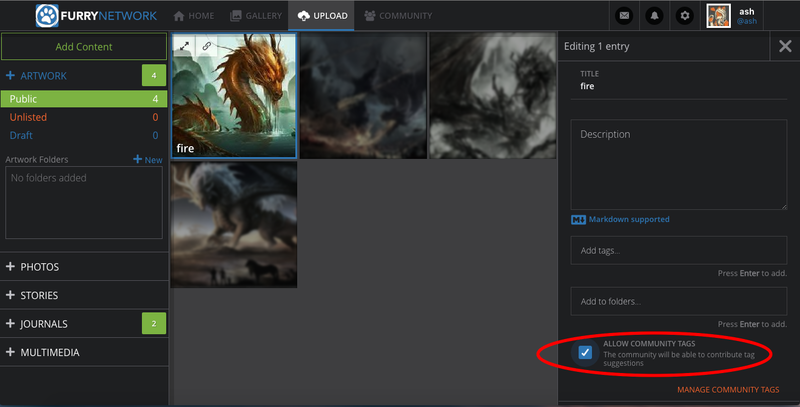 Right now, selections from galleries can be shared and commented on, and furries on the site can interact with comments on submissions. In addition, we have a Discord server that’s grown in activity, and we’ve had the chance to start forming some friendships. Sharing posts to social media. We discussed this last week on Twitter, and it seems like a solid idea. Links can currently be shared with others, but copying and pasting feels like work – it just takes too long for most people to do. Adding a quick share button would increase the amount that content is shared with others. Making promotions more visible. Right now, promoted images are not highly visible on the activity feed. We’re planning to consolidate multiple promotions of single submissions and enlarge the images; this will allow users to quickly see promoted images from people they follow. 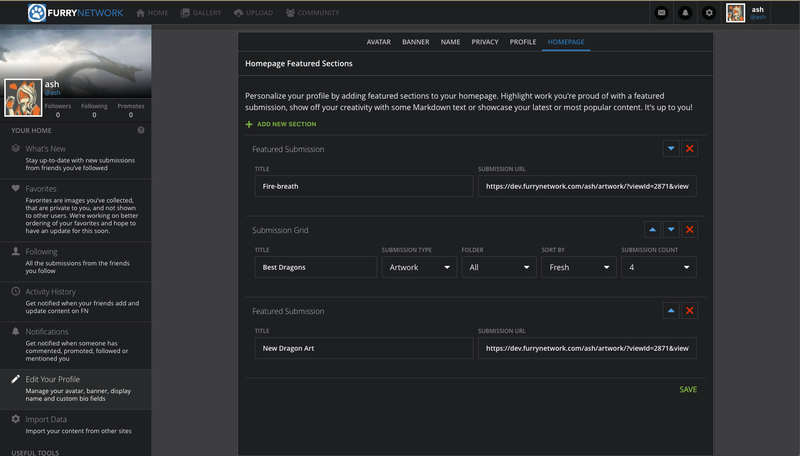 In addition, we plan on having a section for users’ profiles to show promoted images – if you’re promoting it, we want to make sure it can be seen. Improving the activity feed. Right now, the Activity History tab on Furry Network will show you what people have posted, commented on, and promoted. However, it’s not easy to always see what’s happening there. We want to make this closer to a timeline that you’d see on Twitter or Tumblr – allow you to see submissions, share them, and make a comment all from the same page. Adding announcements. When you have something happening, the easiest way to get that across is through a journal. However, a full journal often isn’t needed. Announcements will allow you to share an event that expires after a certain amount of time; this way, if you have an event or a sale happening, users can quickly know and participate. Adding comments for profiles. Right now, sending a compliment either happens on a submission or in a private message; allowing people to drop a quick comment on a profile would help build some of those relationships essential in a community. We understand that some users would prefer not to have that, though, so we’d likely make this optional. We have several other ideas that we’re working through, as well, but we’d also like to see what you have to say! What do you think we could change on Furry Network to help you build your community? Shoot us a message on Twitter with your thoughts. As always, thank you all for your support. We hope to help everyone build the community that they love! While we have some ideas for possible site improvements, there are a few problems that don’t have a cut-and-dry fix. We’ll post about current suggestions, throw out new ideas, and ask for readers’ opinions about the right direction for the site. While we have some things we’re working on to help your work get noticed, there are quite a few things you can do to help get an audience. Throughout posts, we’ll give some information to help you become successful with your work. We’ll also ask for you to chime in if you have any additional tips. As we move along, we’ll compile these posts to give you a solid help database, both specific to the site as well as for success in the wider fandom. While we have the groundwork for a great website, we have a lot of work during the beta period. Luckily, our development team is digging into the next update, and we’re hoping to have it ready by September. This upcoming update will focus on honing the commission tool and setting up the groundwork for finding sellers with content you want – for example, it’s a bit hard to find writers in the mix of artists right now. We will be adding an option to receive an email when there’s an update to a commission. Better tools for sharing and discovering artists. Displaying promoted images on users’ profiles. Additional search functions for commissions. Integration with other select furry sites. Our goal with the updates is to be able to open the commission tool to public testing; we’re also hoping to have all of the major site features completed at that time. From there, we will work on refining individual features and squashing any remaining bugs. Thank you again for all your support! We hope these upcoming changes and posts will help make the commission process more enjoyable and easier for everyone in the fandom. Last night, CloudFlare announced that they had an extremely small percentage of requests that could result in leaked information from previous requests being included by mistake. Furry Network uses CloudFlare to help protect against distributed denial of service attacks. CloudFlare has since resolved the issue that was leaking information, and they have contacted staff to let us know that no Furry Network users were affected according to their knowledge. However, as a precautionary measure, we have logged all users out of the website. We also request that you change your password. Because issues like this may affect a large number of sites, we recommend reviewing your password sharing habits. You should also consider using a password manager and a unique password for each site. CloudFlare’s announcement can be found here. A list of potentially affected sites can be found here. We thank you for your patience with this matter. We’ve been working with our developers to roll out our next update, and it has now gone live! This update involves reindexing submissions, and this process will likely continue through most of Friday. Parts of users’ galleries may not be visible during this process, so if it looks like you have a few submissions missing, don’t worry – those will show up soon. Here are the updates for the site. The Activity History feed is a record of the activity for all the people you follow on Furry Network. Previously, the Activity History feed was text only – there was no way to view submissions or promotions without clicking on the item in the feed. The feed has been changed to have a visual element. Now, published artwork appears large on the feed, and any promotions or comments have a smaller icon on the feed item. This way, you can get a quick glance at the submission and see if this is an artist that may interest you. As a quick note, favorites still do not appear in the Activity History – these remain private to you. If there is something stellar that you want your followers to see, though, hit promote! For several months, sorting by popular has been frozen on past submissions; the “Most Popular Last Week” and “Most Popular Last Month” sections were identical, and there wasn’t any movement in the submissions over time. We corrected this issue, and the sorts now work correctly. The popular feeds now react in real time to the activity on the site, updating as submissions are viewed, receive comments, and are favorited or promoted. We want our users to find some of the most outstanding content on the site, and this will make discovering fantastic creations much easier. Added outlines to blank area when scrolling down. Changed users’ activity to show content when promoting, commenting, or publishing. Popular feed fixed so it updates regularly. Changed What’s New feed to truncate automatically, avoiding site slowing when a large feed is cleared. Corrected issue with imported items appearing in a random order. Extended login tokens from a week to a month. Not all gallery items are appearing in users’ gallery – should be resolved as gallery submissions are reindexed through February 17th. What’s New feed is not showing recent submissions, and some past submissions are appearing multiple times. These site changes have come in preparation for commission testing. Originally, we had planned to begin testing at the end of January or the beginning of February, but we wanted to make sure the rest of the website was functioning well. We are still aiming to begin testing before February is over. We are also working on a text editor for the site. At the moment, the tools to format stories and journals on Furry Network are nonexistent. Our developers have put together tools that will allow easier formatting, and this is expected to be implemented in the next site update. We appreciate your enthusiasm, and we hope these changes will help you find and share content that you absolutely love! As we are moving closer to testing the Furry Network Commission Tool, we have worked to clarify policies and add documentation about how information gathered on the site is used. We have added guidelines in our Acceptable Upload Policy for game and program screenshots. These will be considered artwork and should include content that has been created by the user. Made a detailed red panda model on Second Life? Show it off! Modded a Khajiit to have Nigel Thornberry’s nose? A little odd, but sure, upload it! Screenshots of things that were already in programs or games won’t be permitted. Yes, we know that black chocobo in Final Fantasy XV is adorable, but screenshots wouldn’t be allowed since they would not contain user-created content. If for some reason information does need to be used in another way, the policy will be revised, and we will post an update outlining that change. The development team is currently working on an update for Furry Network. We will roll out several bug fixes, but the biggest change will be with sorting by popularity. Currently, sorting by popularity always shows the same images; this will be fixed to show submissions with the most activity. You will be able to sort by weekly, monthly, or lifetime popularity. We want your outstanding art to be seen by the community, and this will help veterans and newcomers alike to get their work out in the open. 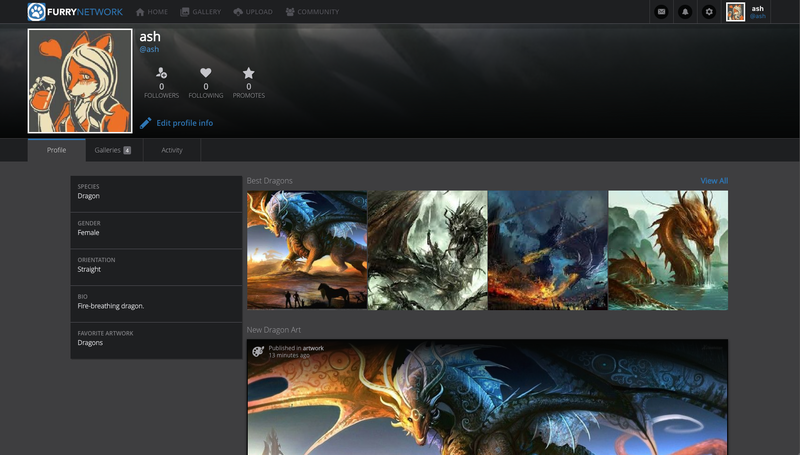 Shortly after we have rolled out the site update, we will begin testing the commission tool. For now, sellers are being hand-picked to test, but any Furry Network users will be able to purchase commissions. We still have a few slots open for sellers, so if you are interested in helping test the commission tool, feel free to fill out our volunteer application. We appreciate the talent and the warm-hearted nature of this community! When Furry Network was created, we wanted to help people throughout the fandom come together to bring worlds and characters to life. We’ve seen the wealth of imagination submitted through various media to the site’s gallery, and your creativity continues to amaze us. One sore spot that has remained for many, though, is the commission process. We have seen cases where people on both sites of a commission have fallen through on commitments; at times, these are eventually resolved, but some disputes drag on for months or years. Many worry about the risks that have come with commissions. We believe that bringing an idea to life should be a fun and exhilarating experience for buyers and sellers alike. Because of that, we have created Furry Network’s commission tool, and we are now accepting volunteers to help test the commission process. How Is This More Reliable? Traditionally, buyers and sellers commissioning art have discussed payment terms. People paying upfront have sometimes never received the final commission, and content creators accepting payment at the end of the commission risk not being paid at all. The commission tool also comes with space to upload reference sheets, a summary showing the scope of work, and statuses to easily sort through the progress on current commissions. In addition, a page showing accounts open for commission provides more visibility for both experienced and new content creators. We will provide more information about the tool as well as the full rule list in the coming weeks. We are looking for 20 content creators to help test the commission tool for the website. Tests will begin either at the end of January or the beginning of February. Because this is a new tool, we expect for some problems to appear on occasion; we will have a staff member available to help whenever any issues arise. If you are interested, please fill out our volunteer application. Note that you do not need to fill this out if you wish to purchase a commission through this system; any Furry Network users may purchase commissions during the testing process. We are thrilled to begin testing this tool, and we hope all involved with commissions can find more excitement in the process of creation. This small update is coming from someone you haven’t heard from before. My name is Digby, and I will be working as the site community manager for Furry Network as we work towards the full release of the website! Furry Network development has been on hold over the past few months, but now that we have the manpower (or foxpower, I suppose), we are expecting updates to roll out over the next couple of months. We have revised the Code of Conduct and the Acceptable Upload Policy in order to add clarity to the rules; this revision will outline content appropriate for the three content ratings and clarify the purpose for the rules in place. We are also preparing the commission tool for live user testing. We know you’re excited for our commissions system, and we are, too! In the near future, we will ask for volunteers to help test commissions. Be sure to keep your eyes on our Twitter account for the chance to get involved in our testing and the project’s ongoing development! We’ve had some great ideas and received lots of suggestions for how we can improve the community involvement aspects of the site for both artists and followers. As we near the full release of the site, we will begin to hold our first artistic competitions! Some contests will focus on artistic prompts while others will throw in added challenges. If you’re not an artist, don’t worry – we’ll have opportunities for all types of content creators (and even if you’ve never made anything before)! We hope to give recognition to your individual way of expressing creativity. If you can make it, we want to celebrate it. Hi, I’m a fox, and I’m new here! I first discovered the furry fandom around 2002, and have been active on and off in it for 10 years. Of course, for the sake of uniqueness, I chose a fox fursona. I’ve written several small fictional pieces within the fandom, and I tried my hand at publishing a series of short story publications. Outside of the fandom, I perform improv comedy, and I volunteer for gaming charity events. My favorite movie is Troll 2, and I make the best lasagna in the world. We all look forward to making this the most exciting site for the fandom! 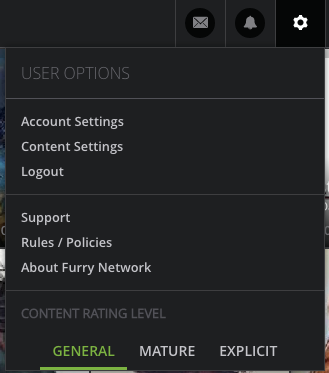 We’ve just launched a little update to Furry Network, improving the Popular feature on the siteas well as fixing a number of bugs. This is one of our ‘wrap-up’ updates adding final polish to the site, before we change gears and start working on policies, promotions, tutorials and commissions. The popular feed now has three options: most popular of all time, most popular last month, and most popular last week. This was added to fix the popular algorithm and keep the popular feed from feeling stale. This is now present in both the main galleries and the character profile galleries. We also fixed a bug which was causing some submissions to not appear in the Popular feed when they should. All newly-uploaded content from now on should show up correctly in the Popular feed. Quite a few users informed us of a strange bug that has been causing people’s profiles to display the wrong contents; this usually came about when you’d view someone’s profile from the following/followers section. This has now been fixed. We also fixed a ton of other little bugs site-wide; if you’ve been having an issue with something on the site, give it another shot – there’s a good chance it’s working now! New popular feed sorting. The popular feed now has three options: most popular of all time, most popular last month, and most popular last week. This was added to fix the popular algorithm and keep the popular feed from feeling stale. This is now present in both the main galleries and the character profile galleries. We’ve set up a shiny new Jobs page, and are looking for an outstanding Community Manager to help take Furry Network to the next level. Do you want a full-time, paid job supporting the Furry community and helping it grow and develop? This might be just the thing for you. See our Jobs Page for more information and to apply. Our Development Team is going to be taking a break to focus on other projects for a bit, while we get the documentation, tutorials and policies side of things brought up to date. As mentioned in our last update, we have quite a few new things ready to go out on the non-technical side of things – and we want to make sure Furry Network is a well-rounded experience. We’ll also be starting the ball rolling on testingo our on-site Commissions features, and refining them for a gradual production rollout (similar to how we did our initial early Beta, where you had to request a key). It’s been another busy week for our team – getting the kinks worked out, and essential new features added! In this blog post, we’ll go over some of the changes since our last update, as well as give you a glimpse into what we have planned for the near future. We’re proud to announce that on June 5th, at 4:52am MST, Furry Network officially passed one million submissions! This is a huge milestone for us – and it wouldn’t have happened without your support. We’re incredibly grateful for all of your support in helping make this possible – and hope we can keep living up to your expectations! By popular request, we’ve readded the Fave, Promote and Delete buttons to the ‘grid’ layout on What’s New. You can now dismiss, favorite and promote submissions right from the what’s new page, without having to switch to linear view or using delete all! All this means that as Furry Network grows, it should continue to be fast and responsive! Things have come a long way performance-wise in the last 3 weeks – and as we grow I’m sure we’ll have more tweaks to make. The import tool now displays a loading message when it’s fetching a captcha image, and has a retry button if it fails. This makes the captcha portion of the importer login a lot less confusing – and more reliable too. We’ve fixed a bug with how flagged posts are handled – most notably, that the user who uploaded it was incorrectly notified that it’d been flagged (by receiving a new ticket notification in their top menu), before one of our moderation team got a chance to look at it. We’ve set it so that now the person who’s submission is being flagged will not be notified, until a moderator has reviewed it and determined the flag reason to be valid. Given that the ticket that showed up in your feed when this happened to one of your posts was very sparse on information – in particular, not including the reason why it was flagged in many cases – it was quite understandably causing undue anxiety for those who received them! Like any site which relies on eagle-eyed users to spot problems, we feel it’s important that moderators take a look at any report before any action – including notifying the user who uploaded it – is taken. We added validation and confirmation when changing your password in account settings. Users are now told their password has been updated successfully, and the fields are cleared after a successful change. There are error messages on the screen when the user enters invalid info in the password fields. Previously nothing happened on this page when updating your password and it was a bit confusing – no longer! We got a lot of questions from users on social media, asking how to add formatting to their stories, submissions and posts – and it turned out that our Markdown cheat-sheet wasn’t visible enough. When hovering over the “Markdown supported” text while editing a story or making a commission announcement, a tooltip explaining Markdown is now displayed. When you click on it, it’ll show a cheat-sheet of some of the things Markdown lets you do. We’ve put a placeholder link in place for some examples – be sure to let us know what examples you’d like us to develop for you on our support site! On the “What’s New” feed page, we previously used a magnifying glass icon on the bottom right to open the menu with filters and actions, which worked great when that page was searchable, but makes less sense now it’s an ‘inbox’ style feed of content. As a result, we’ve updated the icon to a three-line ‘menu’ icon, which should hopefully be less confusing. A number of users reported a bug whereby people’s display names and usernames were being switched on the What’s New page. This is now fixed! Users should not be notified of a pending ticket or see it in their ticket list until a moderator has replied. Users will no longer receive any notifications for tickets unless a moderator replies to it. That way if a ticket is found to be invalid, it can be closed/dismissed without the user ever knowing or being bugged about it. Added validation and confirmation when changing your password in account settings. Users are now told when their password has been updated successfully, and the fields are cleared after a successful change. There are error messages on the screen when a user enters invalid info in the password fields. Previously nothing happened on this page when updating your password and it was a bit confusing. Delete stories from the submission manager. Stories, like other types of content, can now be deleted while editing them in the submission manager. “What’s New” grid items have actions now. While on the list view, it was possible to remove/favorite/promote individual submissions – but this wasn’t present on the grid view. Now users can perform these actions on both views. Fixed missing tooltip message for Markdown on Commission Announcements and Story Editor. 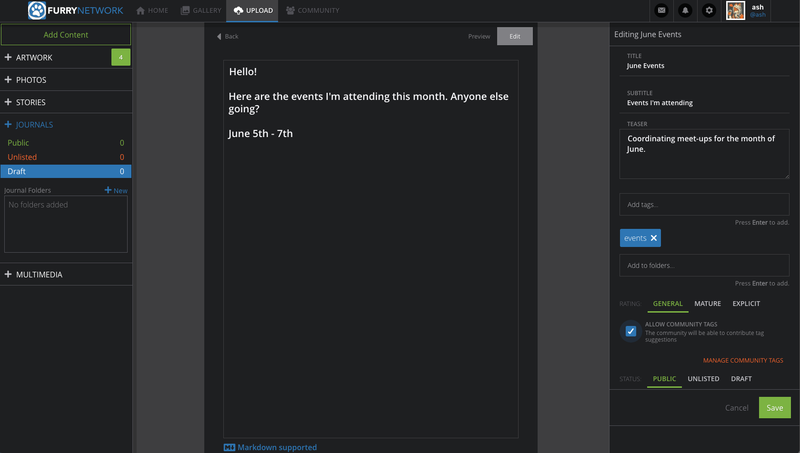 When hovering over the “Markdown supported” text while editing a story or making a commission announcement, a tooltip explaining Markdown is now displayed. Changed the magnifying glass icon on mobile view of feeds. The magnifying glass on feeds on mobile was changed to three lines to indicate a menu. Importer now has loading message when getting a captcha image and a retry button if it fails. This makes the captcha portion of importer login less confusing for users. Fixed typo on tooltip for clearing individual submissions (“you feed” changed to “your feed”). Fixed submissions on What’s New page having display name and @names switched. 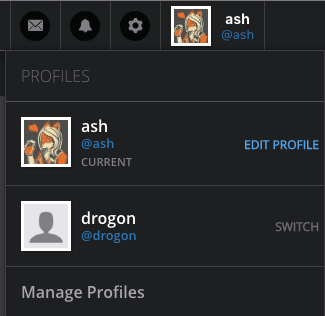 This was a bug involving users who have a display name and username that are different. Submissions on the What’s New page had them backwards – display name showing as username and vice versa. This is now fixed. Fixed multimedia thumbnails in galleries showing up as black spaces in Firefox. Can see multimedia thumbnails in Firefox again. OG/Twitter, submission image not appearing when the url is posted. Fixed this bug so that the image appears when a link to a submission is posted on Twitter, etc. The importer now shows up as “FurryNetwork Importer 2.0” instead of “GuzzleHTTP Client” in FA’s security settings/access log page. We are committed to making Furry Network a fantastic place to be, and part of that is in finishing up this last round of tweaks, polish and procedures, before we embark on getting our Commissions functionality ready for prime time. Our current focus is split into two areas- Administrative and Technical. In addition, we’re developing our internal policies surrounding content classifications, unused usernames, evaluating some edge cases and making sure that we have a good structure in place for moderators to escalate issues in the event that there’s something we haven’t encountered before. Like any site in its infancy, we’ve found no shortage of tweaks needed (both code related and policy related!) – but as always, we’re committed to making things as great as they can be. We have been recruiting additional moderators to the team, building out our staff roster, and getting policies and procedures in place for staff management. Since we launched the site a few weeks ago, our moderation team has almost doubled in size – and we’re planning for further growth, as more people use Furry Network. Our development team has been hard at work fixing high-impact bugs and working on long-term improvements to the site, based on your feedback through our support site. We’ve adopted a ‘lean’ approach to how we prioritize tasks, and meet regularly to evaluate the features, bugfixes and improvements we have planned, to make sure that we can keep up with the changing needs of the site and its users. For this week, we’d like to give you a little insight into what we have lined up right now – though of course the schedule may change a little as things come up or are easier to fix than expected. If toy don’t see your favorite feature on here, don’t fret – we’ll be sneaking in a few little items here and there – and are always open to your input and suggestions. We think you’ll be excited by what’s on the horizon. Finish fixing “Load More Submissions” button on What’s New feed (sometimes it doesn’t load more, and you have to refresh the page to make it work). Fix issue with unsaved edit information being lost on upload for multimedia & price sheet. When editing a piece of multimedia any unsaved text or tag changes will be lost after uploading a thumbnail. When editing price sheet for commission, unsaved instructions are lost after image upload. Publish All / Select All button and batch saving functionality (especially on drafts page). 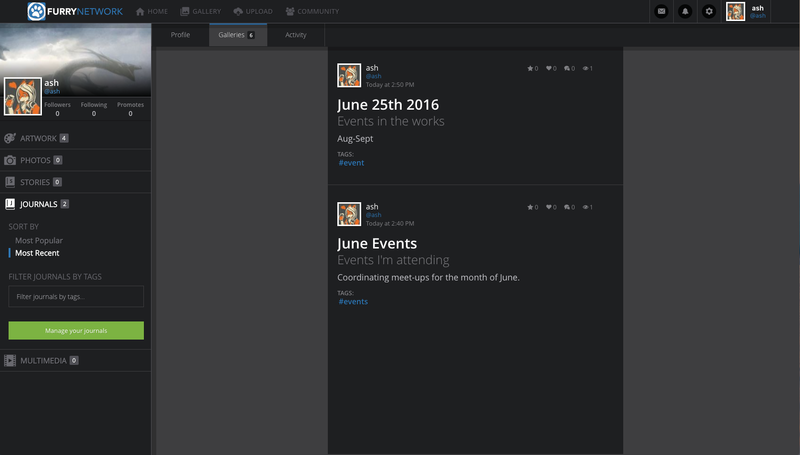 Three big items for this week: Journals/Announcements, Top menu tweaks, and User Profile redesign! These features are some of the most exciting – because they’ll have the biggest impact on the site as a whole, and we expect them to significantly improve how useful and easy Furry Network will be to use. Whew – that was a lot of stuff to go through! Thanks for sticking with us. This is a very exciting time for Furry Network, as we work on solidifying the site’s design and applying that final layer of polish to make it into a finished product. You’ve all been very patient and helpful with us as we get things wrapped up – and for that, we are eternally grateful. We look forward to seeing your reactions to this update, as well as hearing your feedback and input. As always, you can reach out to us on Twitter and get support or vote for your favorite features on our support site. We look forward to hearing from you!